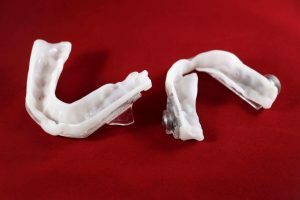 I’ve reviewed all kinds of anti-snoring devices, including pillows, nasal strips, tongue retaining devices, MADs (mandibular advancement devices), and mouthpieces. There is a new entry into the mouthpiece category. The nuSleep OTC is an over-the-counter oral appliance that mimics the process of having your dentist make a custom mouthpiece without the wait or the high price tag. The nuSleep OTC oral appliance is to be used to help alleviate snoring and to treat upper airway obstruction in patients 18 years and older. It is not for use in people with loose teeth, loose dental work, TMJ, dentures, or other conditions that would adversely affect the use of an oral appliance. The nuSleep OTC oral appliance is not yet FTC approved. 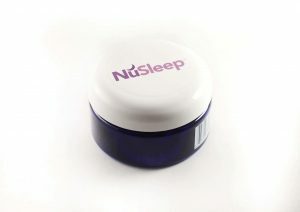 The nuSleep OTC is designed to safely treat snoring and obstructive sleep apnea. 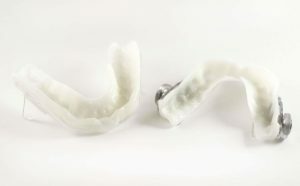 Like other “boil and bite” mouthpieces, the nuSleep OTC is made of a type of plastic that forms and maintains a snug fit around the patient’s teeth. The trays are designed to be sized to fit the wearer’s mouth, eliminating the need for multiple sizes. Before molding the nuSleep OTC, it is important you understand how the device works. The underlying principle is that if you sleep in a position where your lower jaw is thrust forward, your airways will remain unobstructed and snoring will be alleviated. The top tray of the nuSleep OTC has two circular cams, (the small metal pieces on the upper tray that are used to adjust the position of the lower tray). The bottom tray has wings that position the tray in front of those cams. This is the mechanism that holds the bottom tray and your jaw in place. The cams are adjusted with a wrench that is included. When you move the cams forward, your bottom jaw is adjusted forward. Because the nuSleep OTC oral appliance is designed to mimic a custom oral appliance, molding it can be a little bit tricky. There is a video on the nuSleep website on how to mold the trays, but it is almost 11 minutes long, and I had to watch it twice before I felt confident to mold my own mouthpiece. Dr. Hamburg, the inventor of the nuSleep OTC may be a brilliant otolaryngologist, but his video presentation and instructions are not clear. In molding the device, you make sure the top tray is the right size to fit your mouth. If it isn’t, you dip it into hot water to size it. Next, you mold the top tray by again dipping it into hot water. You repeat for the bottom trays. You can size the bottom tray without the top tray in your mouth, but it is crucial that you mold the bottom tray in your mouth with the top tray in. This ensures the appliance will work by properly positioning your lower jaw. It is critical you follow the instructions here as to the water temperature. You boil the water and then must wait at least 75 seconds before you dip the trays. Once you have molded the trays, you dip them in cold water to set them. You must use cold water, with no ice. It is not exactly simple. I watched the video twice before I felt confident enough to properly mold the device. The molding process is not difficult at all, although the instructions are long and involved. Once you’ve watched the video all the way through, you can mold your device along while watching the video, stopping and starting it as you complete each step. I began to wear the device about 30 minutes before I went to bed the first night, to try and get used to it. The device is comfortable and easy to wear, so long as it is molded correctly. I was a little concerned about the cams, as they seem to be a bit unstable. I tightened them as much as possible, but they are still removable, and I was concerned they could pose a choking hazard if they came loose in the middle of the night. As far as the lower tray positions are concerned, I was only able to use the “lowest” setting. And even then, my lower jaw was protruding very far out. It was physically impossible to use any of the other settings. Most of the other mouthpieces I have used have a far wider range of positions. When I wore it on the first night, I was only able to wear the nuSleep for two hours, due to jaw soreness. I then skipped a few nights, since I was using an anti-snoring pillow that worked fairly well. When I decided to try the nuSleep OTC again, it didn’t fit! I don’t know if I fit the appliance too tightly around my gum line, or if it changed shape over the few days of disuse. Fortunately, the product can be remolded, though it is a time-consuming process. The nuSleep OTC has a lot going for it. It is relatively inexpensive when compared to a custom-made oral appliance. Although the molding process is long and tedious, it is not difficult. If you are having trouble molding it, you can set up a free video chat that will guide you through the process. It can take up to 48 hours for confirmation of the call, but the customer support is there. When I was using the device, my snoring mobile apps did not register any snoring at all, so the product does work. If it is too uncomfortable or you cannot get it molded properly, there is a good return policy. Although the nuSleep OTC does what it promises (it stops snoring), there are some serious concerns, least of which is that the product is not FDA cleared. The removable parts of the upper tray can pose a choking hazard. If the product had a setting where my lower jaw was not extended so far out, I may have been able to wear it for more than two hours on the first night, and may not have needed to take a break from using it after the first night. You need to be very careful of the water temperature. If you don’t, you WILL ruin the product. If you mold it too tightly (as I did), you will need to re-mold it. The nuSleep OTC shows a lot of promise. The company is still in the start-up phase. When I purchased the product, they didn’t even have a merchant account – I paid via PayPal. The website is amateurish at best. I think if they address the loose cams in the top tray and make the product more adjustable, they might have a very successful anti-snoring device. Hey Mark, How much did the nuSleep mouth piece cost? Also, how did you feel it compared to the SnoreRx? I already own a custom mouthpiece but I recently had dental work and need a new one… I’m not interested in paying that $1600 expense again. Also, my custom piece did not wear well over time. I’ve had it about 3 years and it was beat up badly. The reason I bring this up is that for the most part it was very comfortable and I’m wondering which mouthpiece is most similar to the ones the dentists custom make? Any feedback would be greatly appreciated. The price of the nuSleep was $129. However, I feel that either the Sleep Pro Custom or the SnoreRx Mouthpiece would be the most similar to custom dentist made devices.